Recent research has documented the success of the All-on-4 approach to full mouth rehabilitation. Previously patients who had failing teeth had to have 8-10 implants placed in each arch followed by 4-6 months of healing and then fabrication of traditional porcelain to metal bridges to replaces all those teeth at considerable expense. The "All on Four" or "Fix on Six" approach is to remove existing teeth, place bone grafts in the empty sockets and then place a minimum of 4 implants in specific locations to support a fixed appliance (either denture or bridge). The gum tissue is then sutured in place and the provisional appliance is attached immediately to the 4-6 implants and the patient can walk out of the office on a full liquid diet but with a smile. The temporary appliance remains in place for 3-4 months while the patient heals and the implant fuses to the surrounding bone. A final appliance can then be fabricated out of acrylic or Zirconia for a natural looking smile that the patient can use to eat a regular diet. The healing time for this approach is remarkable shorter than the older approach and the success rates are roughly the same while the costs are substantially lower. This creates value by allowing more patients to afford the procedure, a procedure which can make a dramatic difference in their self image, diet, nutrition, and general well being. Traditional dentures, while still somewhat popular today, can easily slip out of place, may affect patient speech patterns, and can be difficult to keep clean. Plus, they prohibit the wearer from eating hard or chewy foods, and can block part of the palate - minimizing taste sensations. The All-on-4 system is an implant supported denture system that eliminates the annoying characteristics of regular dentures and delivers an attractive smile with minimal maintenance. How do All-on-4 Implants Work? If you’re looking for implant supported dentures, it is important to understand how the process works. Four to six implants are implanted in the jawbone to act as tooth roots and anchor points for custom bridges or dentures. These implants provide an attachment that existing dentures or a new fixed bridge can connect to, which enables the patient to eat hard foods and clean their teeth just like a regular set of natural teeth. In most cases, the denture can have the palate and phlanges removed to look and feel more like regular teeth. What to Expect when getting the All-on-4 Procedure? First, we will complete a comprehensive consultation to verify that you are an appropriate candidate for the All-on-4 process. Most individuals who do need dentures or a bridge will benefit from the All-on-4 process. Next, we will remove failing teeth and surgically place the implants in the upper and/or lower jaw bone. These implants are the small titanium foundation points that fit into the missing tooth’s root area in the jawbone. These implants are given time to fuse into the surrounding jawbone via a process called osseointegration. This typically takes three to four months. Once the implant areas have healed and the implants are stable, the dentures or bridges can then be installed. A soft diet must be maintained for a short time, but soon the patient can treat their new “teeth” as they would their own natural teeth! Virtually all of the drawbacks related to traditional dentures will be eliminated. Patients can enjoy eating hard foods without fear of embarrassment, and they can brush their teeth as usual. 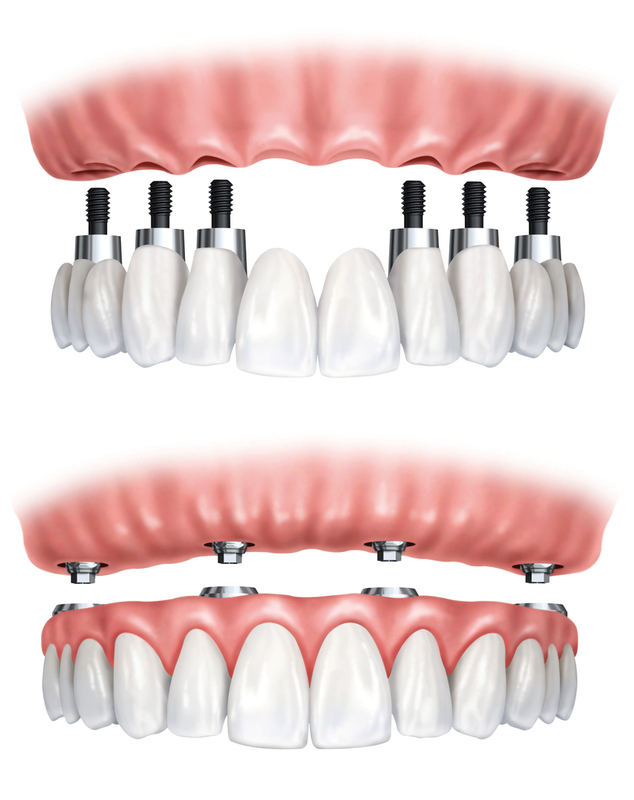 For more information on these incredible All-on-4, implant-supported dentures, contact us today. We look forward to helping you discover a beautiful and healthy smile!